Monday Mayhem continues with a new plate for Mistah J. I’m pretty sue I’ve mentioned in the past that the 1940s were kind weird. Comic books with pretty silly and the wackier they were the better. Batman was especially infused with some bizarre concepts. It was an “anything-goes” era as editors tried to capture the zeitgeist (this got even worse in the 50s when science fiction was in vogue). 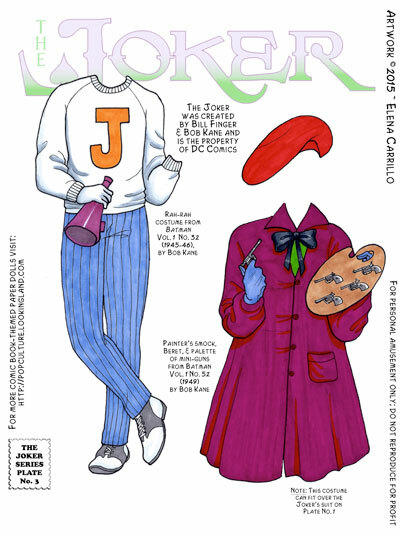 These two costumes are typical of Joker’s fare in the early days. He was always assuming crazy disguises and popping up in unexpected places. It became pretty much a schtick for Batman to be pursuing some criminal only for the baddie to be revealed at the Joker. The artist gag actually made it into the Batman movie from 1989, though Jack Nicholson didn’t have a palette full of little guns, so it wasn’t nearly as cool ~ ha! And for heaven’s sake, put the smock over some other piece of clothing ~ we don’t want the Joker to catch a chill! As usual: to find the doll for this series, click the Joker link in the tags or in the Category listing to the right. So I missed last week’s Fear Friday sorta on purpose, but I don’t want to get into a sloppy habit of skipping because that’s not cool. Just sorta felt like since I’m doing something different for February, I didn’t want to start the new Fear the Walking Dead stuff until March. Just makes more sense to me. 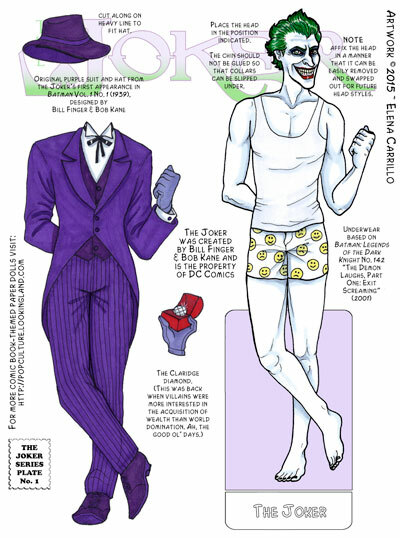 Meanwhile, it’s Mayhem Monday, so you get some costume pieces for the Joker. 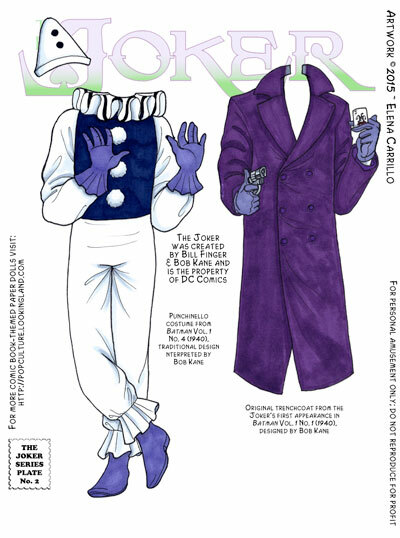 The purple trenchcoat is part and parcel of the Joker’s gear, while the Punchinello costume was featured early in Batman‘s run ~ the first of many clown outfits to come, I guess. But since it was the first, I wanted to make sure to include it. I think Rachel at Paper Thin Personas recently talked about how difficult it is sometimes to write a post when the art you’re posting is so old you can hardly remember making it (or something to that effect). I’m definitely feeling that right now. The whole idea of backlog is counter-intuitive to me. By the time you get around to posting something, you’ve mentally left the building. I guess you can write the posts as you complete the work and hold them in reserve, but that feels so inorganic to me. Not sure if there’s a happy medium, but I think I’m a lot better at this if I post stuff as I make it. Anyhoo: to find the doll for this series, click the Joker link in the tags or in the Category listing to the right. I’m not going to apologize for loving the Joker. The fact that he celebrated his 75th birthday in 2015 means I’m not the only one. Batman’s arch-nemesis was originally killed off in his first appearance, but at the last second, the editors shoe-horned a panel at the end of the story indicating that he didn’t die after all. Since then, the Joker has had a career to rival Wile E. Coyote, getting hit by trains, falling off of cliffs, and even being electrocuted in the chair–but somehow always managing to come back. One of the fascinating things about the character is his social history over such a long haul and how attitudes toward his behavior evolve with each new generation (from a vile disposable gangster to a mentally insane prankster to a sociopath anarchist). Throughout his comic book and film life, the Joker’s been approached and interpreted in dozens of different ways (from pure evil to actually being quite sympathetic). Alan Moore wrote the definitive Joker in 1988’s The Killing Joke so far as I’m concerned. And even Moore’s version is ingeniously ambiguous (the book has polarized fans for almost thirty years). What hasn’t changed about the Joker is his signature purple suit. Oh sure. the style has changed, sometimes dramatically, and then reverted a lot. But he’s also had other colors and costumes throughout his lifetime (I ain’t drawing 75 years worth of purple suits, people!). Still, you can expect to see a lot of purple, while I trawl for the distinct stuff. I think a lot of people think of the Joker as that guy in the funny purple suit with the coattails. Interestingly, there was nothing out of the ordinary about his suit originally; it was a perfectly fashionable cutaway morning coat for 1940; perhaps a bit falutin’, but nothing you would blink at (and the coloring was due to limitations in the press). 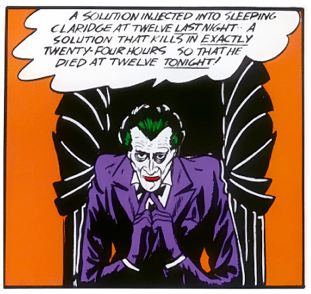 As the character evolved, the purpleness of the suit became a point of interest and even though all the other characters moved on in style as they went through the decades, the Joker remained stuck in 1940 (probably until the 1970s, though many artists still draw him in the long coattails today). But enough of the history lesson for now. I’m working through the entire 75 years of Jokers but I’ll skip a lot (and around). I’m sure I’ll do movie costumes eventually, but the focus for now is on comics. Note: don’t be surprised when you download the .pdf to see the figure’s head detached. As per the instructions, this is so clothes will fit under the chin and you can trade out heads when I draw additional ones. The face here is inspired and heavily influenced by Marshall Rogers and Brian Bolland. Also note: purple is my kryptonite. It’s not a color I “see” well (my red/blue cones must be dented or something). I have a hard time matching or complementing it and often can’t identify it in the wild (i.e. while out shopping). Nevertheless, I’ll try to use a variety of purples throughout this series to keep it interesting.